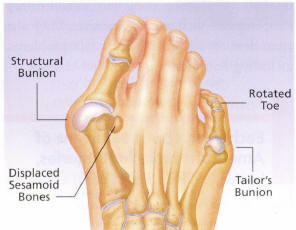 Bunions or Hallux Valgus is a common foot deformity. There are misconceptions about these deformities. Many people may suffer unnecessarily from the pain of bunions for years before they seek proper treatment. A bunion also known as hallux valgus is described by a large bump on the side of the big toe. However, a bunion is more than a bump. The visual bump is a symptom change in the bone struct and bone framework, in the front of the foot. The large toe leans toward the second toe, rather than point straight ahead. These create a misalignment in the bone producing the bump or hallux valgus. A bunion is a progressive disorder. It begins with the large toe leading, gradually changing the angle of the bones. Over the years and slowly producing the characteristic bump; which becomes increasingly prominent. Symptoms normally start to appear in the later stages. However, some people will never develop symptoms. 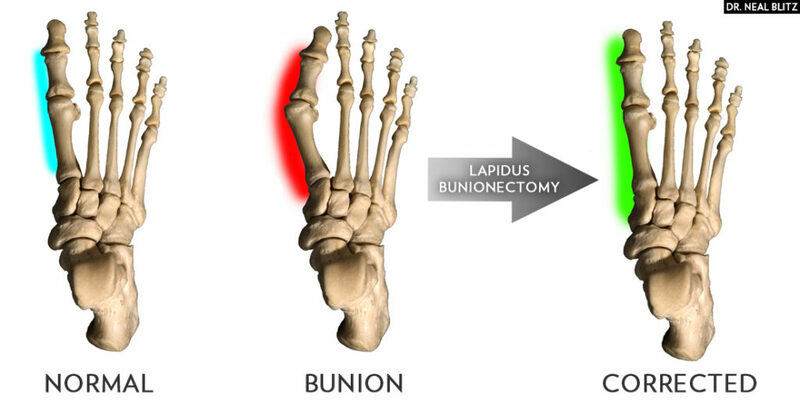 Bunions are often caused by inherited or genetic factors impacting the mechanical composition of the foot. It is not the bunion itself that is inherited. However, certain foot types can cause a person to be prone to developing bunions. However wearing shoes that crowd the toes will not cause bunions. It can make existing deformities get progressively worse – causing symptoms to appear sooner. Symptoms often occur when you are wearing shoes that crowd the toes, such as shoes with a tight toe box or high heels. High heels may explain in part why women are more likely to have symptoms than me. Also, spend long periods of time on your feet can aggravate the symptoms of bunions. By looking at the foot bunions will be apparent, the prominence is visible at the base of the large toe or on the side of the foot. However, to fully understand the condition, the foot, and ankle specialist will need to take x-rays to determine the degree of the deformity and evaluate the changes that have occurred. Due to bunions being a progressive ailment, they do not go away; they will become worse over time. However, not all cases are the same. Some bunions progress more rapidly than others. 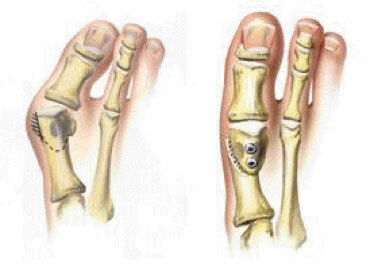 Once the foot surgeon has looked at the bunion, the treatment plan can be developed that is best suited for you needs. The doctor may be able to establish treatment of bunions by observing it. Reading, the chance of damage to the joint, periodic evaluation and X-rays by the surgeon, are advised. Changes in shoe-wear – by wearing the right type of shoes you allow the sh won’t cause additional damage. You should have wide toe box, and forgo pointed toes or high heel which aggravate the condition. Padding – Adding pads to the area of the bunion can minimize pain. These can soften be obtained from your medical provider or at a drug store. Change your activities -Avoid activity that causes pain; which may include standing for long periods of time. Orthotic devices -In some instances, custom orthotic devices may be provided by the foot and ankle surgeon. If nonsurgical options do not provide relief for your bunion pain and when the pain of the bunion interfere with daily activities, you may want to discuss surgical options with a foot and ankle surgeon. Together you may want to decide if surgery is best for you. In selecting the procedure of the combination of procedures to your particular cases, the foot and ankles surgeon will take into consideration the extent the deformity based on the x0ray finding your age, your activity level, and other factors. The length of the recovery prod will vary depending on the procedure of procedures performed.